Austin, Texas has always maintained a reputation as a different sort of Texas city, proud of it’s originality and unabashedly weird. This sort of friendly, incubating atmosphere has fostered countless subcultures over the years and one particularly expansive and successful offshoot is Austin’s disc golf community. Disc golf is a sport with modern roots going back to California in the 1960s; it involves throwing modified Frisbees around various obstacles into designated baskets according to rules very similar to traditional golf. Disc golf arrived in the Austin area shortly after it’s California debut and has developed a strong following. The Austin area has around 20 disc golf courses within a 30-minute drive, multiple enthusiast clubs and one of the world’s largest disc golf stores. Historically, Austin’s Pease Park and disc golf have gone hand in hand. The park opened its disc golf course in 1989 and the course’s central location and proximity to campus attracted large amounts of disc golfers. Too many actually, according to the Austin Parks and Recreation Department. The heavy amount of foot traffic around Shoal Creek led to erosion issues, which threaten trees along the shoreline and expose wastewater pipelines. The bank loss and compacted soil were also taking their toll on the park’s natural ecosystem. The Austin PARD opted in 2010 to close the course to prevent further damage and allow groups such as the Shoal Creek Restoration Project uninhibited access to recuperate the area. However, acknowledging the high demand for disc golf in Austin, the PARD initially promised to open a new course as a consolation. The new course was planned to adjoin a southeast Austin park, Roy G Guerrero Park on the south side of Lady Bird Lake. The proposal involved using 7 acres of existing parkland and 28 acres the city bought in 2007 and had yet to develop. The momentum of the project ground to a halt when it met resistance on two local fronts. The first opposition was support of developing the land into neighborhoods, which while not coinciding with the PARD’s intentions did make sense under the original zoning of the land. The second argument against disc golf came from nature advocates, who believed that the stress on the ecosystem seen at Pease Park would also occur at this new course. Specific worries about the health of the historic Pecan and Heritage trees in the area spearheaded this argument. These claims are representative of more general trend in the Austin area to set aside nature preserves, a trend that has seen remarkable success in the greenbelt system. Now the new course is in limbo, the PARD has chosen to study the issue before moving forward and an advisory committee is weighing the practicality of other sites for a course. If environmental concerns are truly a priority, then perhaps time should be a more pressing issue in this case; the disc golf community in Austin has not shrunk, and by removing a popular course you are just channeling more traffic through the courses that remain. Personally speaking the current course at Bartholomew District Park off of east 51st looks worse in terms of erosion than Pease Park ever did. Furthermore, the damage to trees argument needs either better proof or to be debunked. The PARD’s reasons to close Pease Park did not include tree damage from discs, so how can this fear justify putting a new course on hiatus? If the danger is to the root system, careful course layout and the use of “out of bounds” areas can circumvent this problem. I believe the solution moving forward requires the PARD to better promote their own mission, which is to serve the Austin community at large with quality “recreational, cultural and outdoor experiences”. Right now the disc golf community in Austin feels marginalized at the expense of smaller local interests. While local groups must be considered and protected, they cannot have an undue share of influence in how the city operates. Other disc golf courses are currently experiencing the high activity level seen at Pease and will experience similar fates unless the city acts to meet the growing demand for this recreational sport. The city of Austin is expanding and changing at an incredible pace and will continue to do well into the foreseeable future. Taking this into account, it is the duty of the city and its citizens to continue to protect and encourage Austin’s cultural identity. It would be a shame for us to lose touch with the original ethos: “Keep Austin Weird”. Austin360: Are disc golfers ruining Pease? 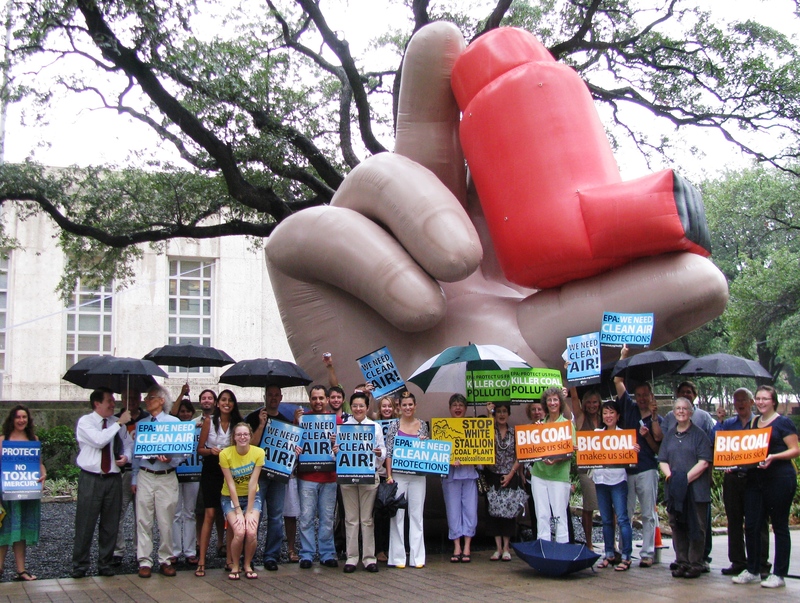 Yesterday, Houston’s Vice Mayor Pro Tem, City Council Member Ed Gonzalez gathered with health and environmental advocates in front of an eighteen-foot inhaler at the reflection pool outside Houston City Hall to release Sierra Club’s new study showing the potential risks to Houston residents of increased ozone smog from the proposed White Stallion coal plant. Ground level ozone concentrations, or smog, measured at air quality monitors in the Houston area and averaged over eight hours, are often above the 84 parts per billion (ppb) limit, a National Ambient Air Quality Standard set by the US Environmental Protection Agency (EPA) in 1997. The Houston area therefore has been designated a “non-attainment” area for ozone and the City will struggle to meet attainment of the 84 ppb ozone standard by the year 2018. 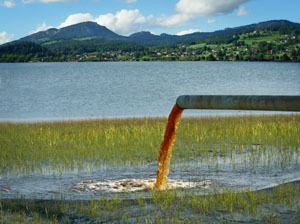 The US EPA will announce in mid-2011, a new, health-based standard that will be a value between 60 and 70 ppb. White Stallion proposes to release emissions of 4,048 tons/year of Nitrogen Oxides (NOx), 288 tons/year of Volatile Organic Compounds (VOCs), and 5780 tons/ year of Carbon Monoxide (CO) from two stacks that would be located near Bay City in Matagorda County about 75 miles to the Southwest of Houston. For the Houston area monitors, the maximum increases in daily peak ozone concentrations averaged over 8 hours and averaged across all days of the episode when ozone values were greater than 70 ppb, 65 ppb, and 60 ppb was 0.03 ppb, 0.04 ppb, and 0.04 ppb respectively. The potential threat of additional pollution in the Houston area from the proposed White Stallion plant is cause for concern from Houston parents of children and Dr. Stuart L. Abramson. Although the Texas Commission on Environmental Quality gave White Stallion a permit, the permit was remanded after a legal challenge showed that White Stallion filed multiple and conflicting plot plans to different governmental agencies. Posted by Donna Hoffman, Communications Coordinator, Lone Star Chapter of the Sierra Club. Thanks Jared Pesseto, Sean, and Ben for inflating that humongous inhaler hand in front of Houston City Hall. 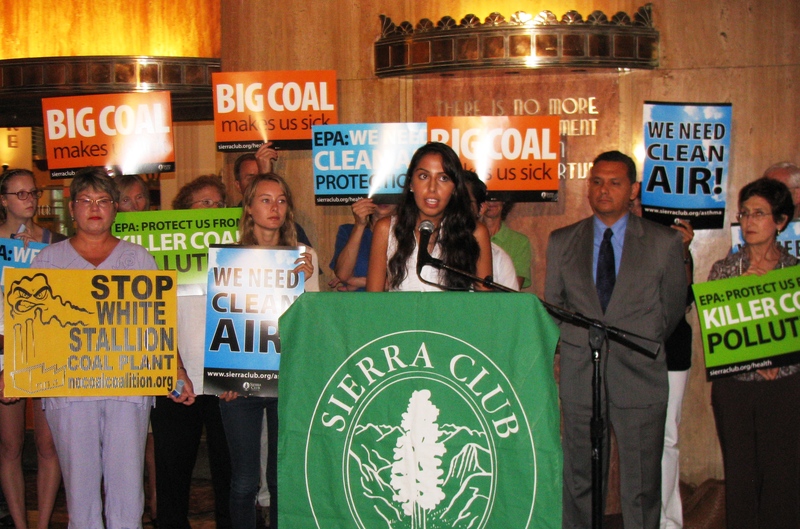 Check out the photo album on the Texas Sierra Club page on Facebook! Houston simply cannot afford a new source of air pollution. According to the American Lung Association, Houston has one of the poorest air qualities in the nation. It’s no secret that Houston has refineries next door to neighborhoods along the ship channel. Within these communities, entire families live and their children go to school breathing air ridden with all kinds of pollutants. 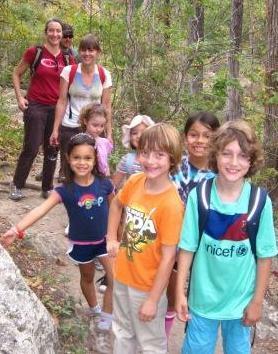 The ALA estimates there to be more than 96,000 children at risk for pediatric asthma, based on recent census data. Could this be because Harris County has such unhealthy air? The ALA gave Harris County an “F” grading, based on annual average ozone levels. Businesses and refineries that emit pollutants in the Houston area have rarely stayed under the EPA limit, if at all. In neighboring Matagorda County the potential for air pollution emitted by the proposed White Stallion coal-fired power plant will make it harder still for Houston to achieve clean air. If this coal-fired power plant is allowed to become fully operational, the quality of air in Houston will have even more difficulty staying under federal limits. 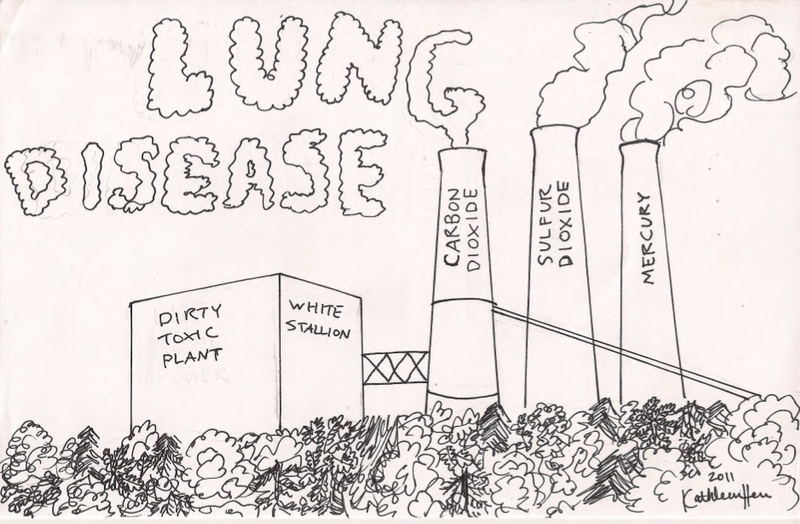 In a health impact study conducted by MSB Energy Associates on the proposed White Stallion coal plant, emissions could add more than 400 cases of chronic bronchitis. This pollution may exacerbate the asthma of about 13,000 who already live with the condition. The most chilling effect is that there will be 630 deaths directly attributed to the pollutants emitted by this coal plant. This could be the death of a parent, a caretaker, or a child. Another startling number to look at is the health care costs of such a plant. Although the plant will provide funding to Bay City’s schools, the total estimated cost of health care due to air pollutants is more than $5 billion! Already in hard times, we as Texans simply cannot afford a new coal plant. Houstonians, please contact Mayor Parker and urge her to continue her support for clean air. 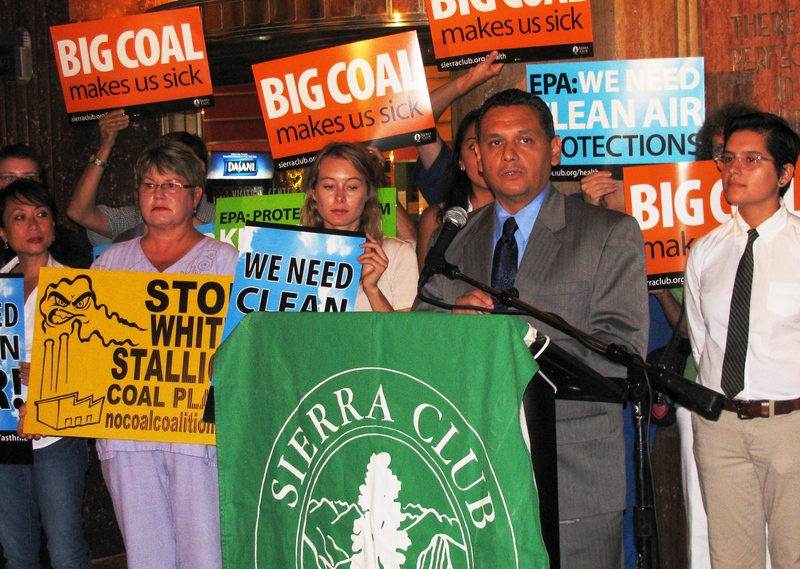 Tell our mayor that we can’t afford a new coal plant, to say NO to White Stallion. If you are interested in volunteering, please contact Kat at kat.m.herrera@gmail.com. Better Mercury Standards? It’s a no brainer. Currently the EPA is considering increasing protections on various air toxics, including mercury. The safeguard proposed will prevent 91% of the mercury in coal from being released into the air. This safeguard has been proposed because of a study conducted by the EPA in 2000 which found that 7% of women of childbearing age are exposed to levels of mercury high enough to hurt the developing fetus. 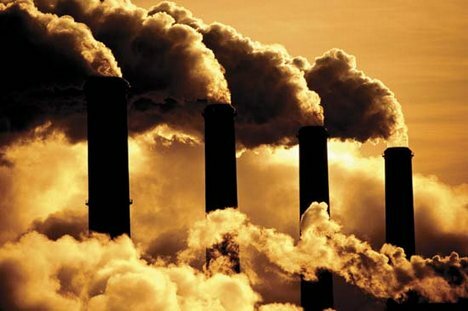 Due to the results of this study the EPA feels that it is necessary to regulate mercury, as well as other air toxics, produced by power plants. Mercury has been studied most in young children and pregnant women, where it has been found to lead to neurological problems including verbal, visual, motor, and learning disabilities. If exposed to mercury, women who breast feed may also expose their child. According to the EPA, about 300,000 infants each year have an increased risk of being born with learn disabilities because they were exposed to mercury while in utero. Moreover, in as study contracted by the EPA mercury was found to be associated with cardiovascular problems, namely acute myocardial infarction, through epidemiological evidence as well as other measures. Humans often ingest mercury from fish. However, one of the largest sources of mercury is coal plants. The mercury in coal is released into the atmosphere when coal is burned, and may then be transported long distances. After this, mercury accumulates in clouds and becomes a part of the water cycle. The process of bioaccumulation begins with tiny aquatic plants and animals that take in mercury from the water. These are then eaten by larger fish, and so on. However, with each step up the food chain, the concentration of mercury increases until it reaches levels that are unsafe for humans. Mercury emissions in Texas are the highest nationwide and Texas has 5 of the 10 top mercury polluting coal plants. These plants are Martin Lake in Rusk Co., Big Brown in Freestone Co., Monticello in Titus, Limestone in Limestone Co., and H W Pirkey in Harrison Co.
A study conducted by the Costal Bend Bays & Estuaries Program in 2010 tested levels of mercury, polychlorinated biphenyls (PCBs), polychlorinated dibenzodioxins (PCDDs), and polychlorinated dibenxofurans (PCDFs) in various fish including spotted seatrout, black drum, and redfish. A total of 49 fish were tested and they were found in various bays along the coast ofTexas. Although smaller fish did not contain high levels of the contaminants, 4 out of the 5 oversized redfish collected in the surf zone contained levels of mercury high enough to be deemed unsafe for consumption by Texas Department of State Health Services. Moreover, the larger the fish, the more mercury that had accumulated. The average age of the redfish in this study was 20 years and these fish have a lifespan of around 50 years. It is expected that if the same conditions are present, these fish will continue to accumulate mercury. Redfish are a popular catch and fishermen sell many pounds of meat from the two oversized redfish they are allowed to keep. Although no conclusions can be made as the study was small, the Coastal Bend Bays & Estuaries program recommends further studies on the levels of contaminants in redfish and the Texas Department of Health Services is reviewing the study to determine if consumer advisories are necessary. 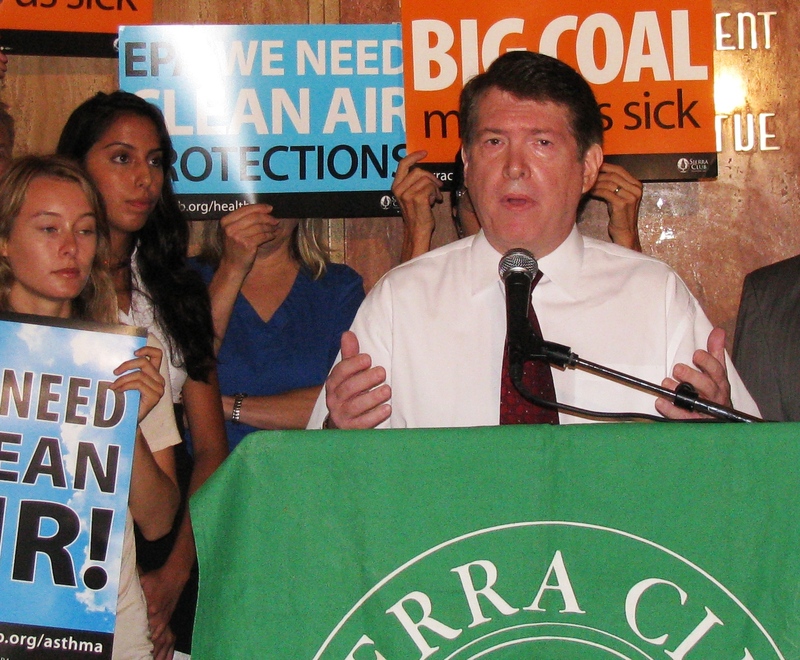 Support the EPA’s efforts to reduce harmful mercury pollution by submitting a comment here. For more information on the safeguard visit the EPA’s site. 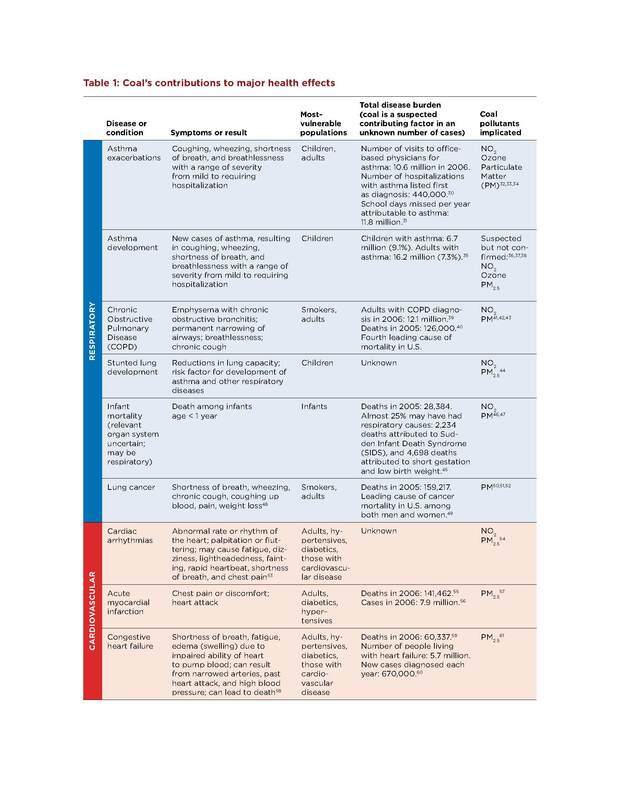 For more information on the health impacts of mercury and the worst mercury emitters check out the EPA’s site and the Environmental Integrity Project report. For more information on the study conducted on Texas Fish visit this site. 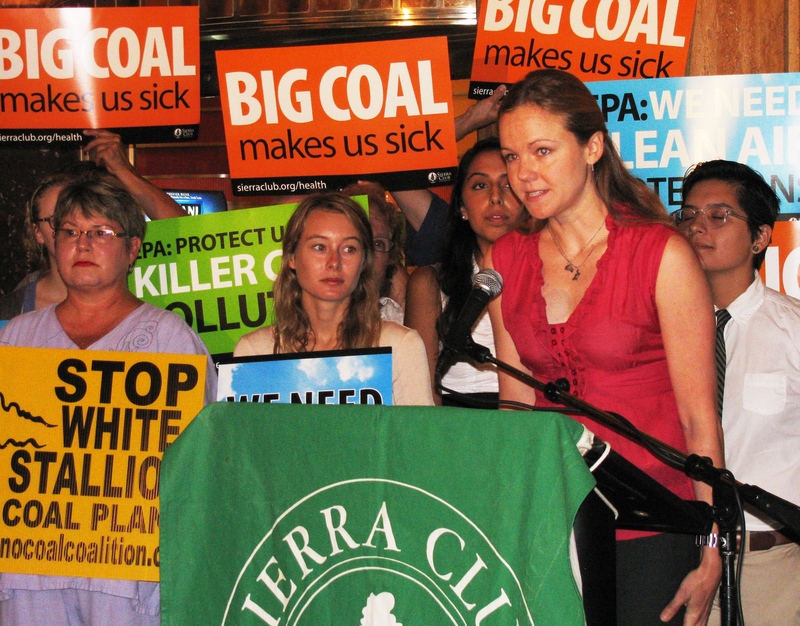 – Julia Von Alexander , Sierra Club Beyond Coal Intern.